Premium lightweight industrial aluminium modular access tower system featuring a climbing frame. The most efficient scaffold tower we stock. Why? 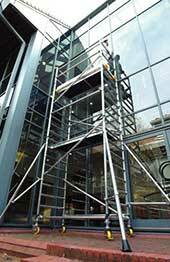 The boss climba scaffold tower system has twice the number of rung spacing of our standard ladder frame tower. This means the platform can be placed a lot closer to the perfect working height for the job. Because workers are in a more comfortable position when carrying out their tasks, the work rate increases. Work is completed quicker and quality increases. For super-fast, efficient results every time, it is essential for construction workers to work at the perfect height for the job in complete safety. The Boss Clima Scaffold Hire, a premium lightweight industrial aluminium modular access tower system featuring a climbing frame, does just that ensuring peace of mind and truly professional workmanship during every task. This handy bit of kit is specially designed for when professionals need to work at a precise height. The end frames have twice as many rungs in them which are spaced at 250mm rather than 500mm as in the standard frame tower which allows for easy access and climbing. That means construction workers can use this system to maximise their efficiency with the simple-to-use Boss Clima Scaffold Frames. It also offers them the chance to place the platform much closer to their area of work and the perfect height. The system is particularly good for jobs which are being carried out in cramped or stretched positions where in usual circumstances, the end results may end up being less than perfect. Because workers can be completely comfortable while using the Boss Clima scaffold frame it will be reflected in their work by allowing them to complete tasks faster and increasing the quality of their craftsmanship. Other advantages to the system include ribbed tubing on each rung for extra grip, slip resistant decks with self-closing trap doors and windlocks and a safe working load per deck of 275kgs. Like the standard scaffold tower, the Boss Clima scaffold tower also has colour coded braces so it simple to put together and locking castors for the ultimate stability while the equipment is in use. It is so easy to erect, even a beginner should be able to put it together in around an hour without special tools or training.